Every Indian is mad about movies and cricket because they are the only two source of entertainment and IPL is the grandest festival of all because it serves cricket and the glamour of movies at the same place. "log sirf 3 chizo ki wajah se IPL dekhte hai, entertainment,entertainment and entertainment aur IPL entertainment hai"
What crazy thing I have done to watch a cricket match ? We are a cricket crazy nation and we do all kinds of crazy stuffs to watch our favorite team play. Being in Delhi, the most important of all is taking the metro ride back to home during the office closing hours.Yes, my friend you have heard it right. Taking the metro ride home during the office closing hours is no child's play. When you are out of the office and you think it's easy then suddenly you find the gossip mongers of your office standing around the corner of the road or at the nearest shop. You have to quickly device a plan to avoid them or you would be stuck with them for who-knows-what-time. Now the real work starts, running, jumping and sprinting through the stairs and concourse to reach the platform of the metro station. Yes,the frequency of the metro is really good during that time but the bigger problem is finding a right place so that you can at least enter the train. There are always few people who are busy talking,your work is to find them and somehow managing to stand infront of them. They would hardly notice and when they will I would be already inside the train. Yes, I break the metro lines. :P :D IPL ke liye kuch bhi karega. Now, when you enter the train it's almost feels like you are getting mobbed. It is hugely suffocating and you are not free to move a single body part.Few perverts get a free hand and I mean literally they get a free hand to do anything. While we are having a hell of a time after going through our full day of labor, few people are enjoying this chaos in their own way. In the train you will always find an old uncle who is angry without any reason and a really weird looking man with even weird accent giving all kinds of tips to the passengers. Ssshhh Mr.Idiot, nobody is interested in your tips and neither in your incorrect history and more than that even if anyone would have been interested in it still they would not be able to understand it because of your weird accent. There is another talent in them, they actually don't have a voice they have loud speakers attached to their vocal cord. There is no where you can go and the moron will be giving tips at his loudest voice possible. kanna keep calm Just count the minutes and you will reach your home. Finally you get down at your stop and there is another race to reach the exit as fast as possible because if you are late you will be stranded in the queue for half an hour, not exactly but that's what it feels like. 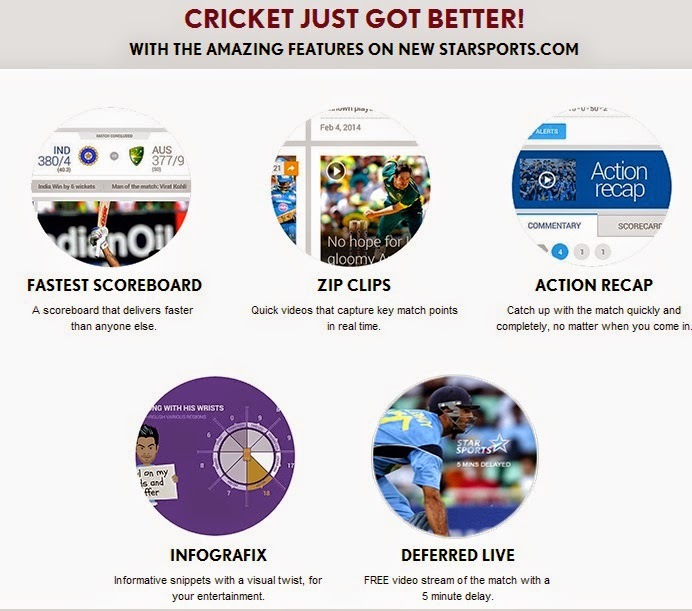 One thing that I love about Starsports.com and how it has changed the way I follow the game has a very answer. If you have read the post, you would know how much trouble a genuine cricket lover has to take to reach on time to watch the match. Now, this problem is gone. You don't have to run and neither have to worry about catching the metro. You can relax and watch the match in your mobile. Find a good place to sit and catch the live action. That's not all even if you are travelling you can enjoy the match on the go. Yes, in the metro as well. Awesome thing is that when you are watching the match live in your mobile, people automatically give space to you so that they could also catch the match live with you and suddenly you notice all the people around you are looking at the match in your mobile. Cricket is one thing that bring the whole nation together and even the fanatic crowd of the metro to a standstill. This post is a part of Cricket just got better! Activity by starsports.com in association with BlogAdda.com.